1. Let’s start with a normal day. Unwantingly and lazily u need to get up in the morning, no matter u stay at home or away from home. One difference here can be that at home ur mother forcefully removes ur bed sheet, pulls the curtains away which leaves no option but to get up. Ur roommates will rarely do that. They make attempts to awaken you but if u don’t, they will let u enjoy the sleep – after all that is what they also want to do. The result of this Can be u reaching office at Lunch time. 2. Now suppose you get up on time and reach the office. Here u wont be served Aloo paranthas with a kilo of white butter on top and a glass of lassi to go with it. You need to stand in a queue and often juggle between 2 -3 caterers to get a glass of juice and a stale looking bread omelet with a bread slice measuring an inch square.. O.k. not literally but I guess u got the meaning. 3. Now in lunch too there are no hot chapattis with green vegetables, curd etc for u on a platter. Again u have to stand in a much longer queue and hope that the food doesn’t get over by the time ur turn comes. No need to compare the food, I guess. All you find is 3 – 4 colours in ur plate. The question “What did you eat in lunch” can be asked in Kaun banega crorepati and let me tell you, the lifeline “Phone a Friend” won’t be useful there. 4. In the evening again u need to struggle to go up to the supermarket to get a packet of milk. Just tear open the packet and drink it. Who will wash the utensils!!!! 5. Now normal dinner story would have gone the lunch way but lets suppose you have a Project party. Now there won’t be any calls every half an hour asking “when u will reach home?” You can easily have 2 rounds of bowling, then a lavish dinner party. When u reach back home theer would be no anxious faces pacing down the drawing room. Just go, change ur clothes/ remove ur clothes / be in ur same office clothes and lie down and sleep peacefully. 6. Sleep peacefully bcoz in the morning there wud be no questioning that why are the clothes lying somewhere on the floor or why the almirah is not set and all things are just bundled up there. Do whatever u like – live the way u want!! Ya, there can be some sporadic comments from ur roomies about being messy but u may also be the cleanest person among them despite being the untidiest at home!! 7. Washing clothes is a major headache but it is somewhat reduced if u have a maid. But it leads to another problem. Identifying ur clothes from among all the washed ones. At Home everything was sorted and neatly set into ur almirah. But here u need to carefully find ur belongings (Remembering whether ur underwear is Jockey Poco or Jockey Rio is an important part of it!). The minutest of differences in Socks are to be carefully analyzed before the partition takes place. 9. God save you if u have a broken button or a torn cloth. U need to keep it separate for the week end. And on the week end, u get up fresh and the first thing u do is go an buy a needle and thread. Then next hour or so is spent in thread finding the hole in the needle ( ok I am exaggerating here!) If u succeed, the rest of the afternoon goes in somehow making a joint so that it holds at least till a week. If not, that garment may well be disposed instead of spending another day on it. 10. 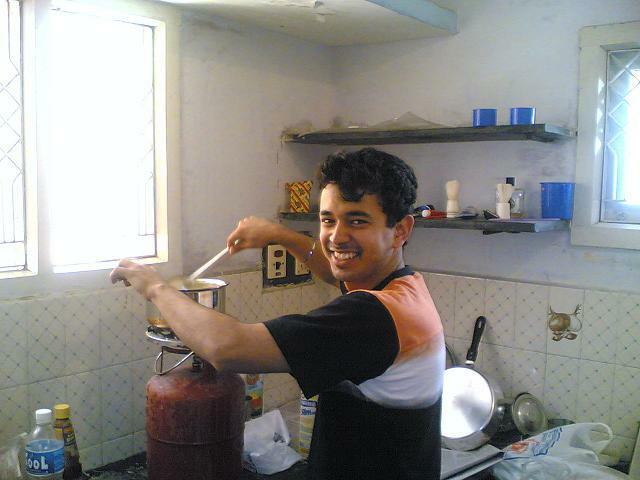 At home having maggi was a big occasion. There was an excitement because u used to get to make it on ur own. Now u drag urself to kitchen when u r hungry – find something – fin only magi. Make it and eat uit. A regular work. No excitement at all. And Not to mention the Big Fight over who is going to wash the utensils. Its better to cut out the tasks before hand. All in all it’s a nice independent experience to have a home away from home. From the entirely dependent life to doing everything on ur own ( with support from roomies), U learn a lot and become more mature. Very true pal. Though I'm not in India at the moment par haalat yahaan bhi waisi hi hai. lol. Feeling Nostalgic man!!! Great article!! !